Bolivia’s social and union movements are highly organised and politically powerful. Labour organisations built their strength in opposition to the dictatorships of the 1960s and ‘70s but were then weakened when neoliberal reforms were implemented in the 1980s and ‘90s. This led the peasant unions from the highlands in the west of the country and peasant and indigenous movements from the east to come to the fore, often defending territorial interests. These trade union and social movements, together with neighbourhood organisations and unions of informal workers are now represented in government by the MAS party and Evo Morales, Bolivia’s first indigenous president. After several faltering attempts to unify Bolivia’s labour organisations, the Central Obrera Boliviana (COB) was created, in the wake of the 1952 Bolivian nationalist revolution. The COB brought together workers’ movements from Bolivia’s main industries at the time, most importantly, the Bolivian miners’ union (FSTMB) and the manufacturing sector. In the 1960s and 1970s it played an important role in the struggle for democracy against military dictatorships as they, in turn, tried to dismantle the trade unions, targeting leaders of the COB. The COB stood out in Latin America as being a single and united union congress, where decisions were made by the workers and members themselves, rather than following party divides. Following the return to democracy in the early 1980s, the state mining company COMIBOL was privatised and tens of thousands of miners were left unemployed. This led to mass migration from the mines to the countryside and cities. Finding work as small-scale farmers or in the informal sector, the miners brought their traditions of trade union organisation with them. This led to the emergence of the cocaleros, or coca-leaf growers’ unions and the strengthening of the highland peasants’ unions, the gremiales (organised guilds of street-sellers and other informal trades) and urban neighbourhood groups. Evo Morales rose through the ranks of the cocaleros to become leader of their federation. In the east of the country, social movements also began to develop from the 1970s onwards. The indigenous people in that region had historically been denied land and rights as equal citizens. Peasant unions and the CSCIB (Interculturales - union of western indigenous people who had migrated and settled in the east of the country) were present from the ‘70s, and these were joined by the CIDOB (Indigenous Federation of the East) which formed in 1982. In 1990, the eastern indigenous organisations staged their first big march, (34 days from Trinidad to La Paz) to demand respect for their rights and access to land. During the 1990s, organisations from the highlands and lowlands came together to articulate their demands for sovereignty over natural resources, land rights and a new constitution. These movements organised various marches to La Paz, often covering hundreds of miles, demanding that the government recognise their claims. The so-called Cochabamba ‘water war’ in 2000 over water privatisation brought rural and urban communities together in a common struggle. It was followed up by more protests throughout the early 2000s, with peasants often taking the lead. 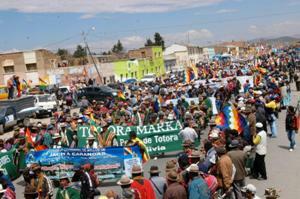 The ‘gas war’ protests of 2003 brought together urban neighbourhood organisations in El Alto. They blocked roads into La Paz, causing the main city to shut down. In 1997, leaders of the social movements took part in national elections; four candidates were elected to the national Congress, including Evo Morales. In the 1999 local elections, several social movements participated using the party name of the Movement Towards Socialism (MAS). Subsequently, in the 2002 national elections Morales, as the presidential candidate of the MAS, was beaten by a just slim margin. By 2005, the MAS party had formed a pact between the most powerful social movements in the country: the peasant unions (CSUTCB and FNMCB-BS), indigenous organisations (CIDOB and CONAMAQ), the CSCIB and the landless movement (MST — Movimiento Sin Tierra). Allied with these organisations were the cooperative miners, the FEJUVE neighbourhood organisations, the union of manufacturing workers (CGTFB), unions of informal workers, and the teachers’, pensioners’ and miners’ unions. The strength of this alliance, and its ability to reach out beyond these constituencies to the middle class, was demonstrated when the MAS won the 2005 elections with a landslide 54% of the vote, unprecedented in recent Bolivian history. One of the central demands of the social movements had been for the convening of a Constituent Assembly to re-write the Bolivian constitution. This would be a way to “re-found” the Bolivian state, to include Bolivia’s diverse ethnic and cultural groups and to enhance the rights of all Bolivians. Once in power, the MAS government convened the Constituent Assembly and representatives from across the country were elected in July 2006. Social movement leaders took part in the assembly and assembly members consulted widely with groups throughout Bolivia. In November 2007 a final constitutional text was approved and delivered to the president. This was then put to a national referendum in January 2009 and it was ratified into law with a 61% ‘yes’ vote. The new constitution recognises the 36 indigenous groups in the country, and guarantees many important rights, including those relating to trade unions, workers and the right to organise. It recognises the right to dignified work with job security, adequate wages and health and safety procedures. It protects the right to join a trade union and guarantees that the state will respect the ideological independence of unions and the trade union principles of democracy, political pluralism, internationalism and solidarity. It also guarantees the right to strike and has special provisions to protect the rights of women workers. Central Obrera Boliviana (COB): Bolivian trade union congress, to which all of the main unions and many social movements are affiliated. Confederación Sindical Única de Trabajadores Campesinos de Bolivia (CSUTCB): powerful highland peasants’ union. Federación Nacional de Mujeres Campesinas de Bolivia – Bartolina Sisa (FNMCB-BS): women peasants’ union. Cocaleros: union defending families growing the coca leaf (a traditional plant, used locally to hold off hunger and tiredness) against forced eradication. Confederación Sindical de Comunidades Interculturales de Bolivia (CSCIB): union of highland indigenous people who have migrated and settled in the eastern lowlands. Previously known as Colonizadores (CSCB). Confederación de Pueblos Indígenas del Oriente Boliviano (CIDOB): organisation of indigenous peoples from the eastern lowlands. Consejo Nacional de Ayllus y Markas de Qullasuyu (CONAMAQ): organisation of indigenous people and communities from the western highlands. Movimiento Sin Tierra (MST): landless movement based in the eastern lowlands, formed in 2000. Federacion de Juntas Vecinales (FEJUVE): urban neighbourhood committees organised at the national level. Federación Sindical de Trabajadores Mineros de Bolivia (FSTMB): miners’ union, particularly strong up to the 1980s, when many miners lost their jobs. Confederación de Trabajadores Fabriles (CGTFB): union of manufacturing workers. Gremiales: guilds of informal workers such as street vendors.